I want to thank Lynn Wilson, Derek Leistra, Cynthia Carley and Kriss Grove for attending the N.A.R. 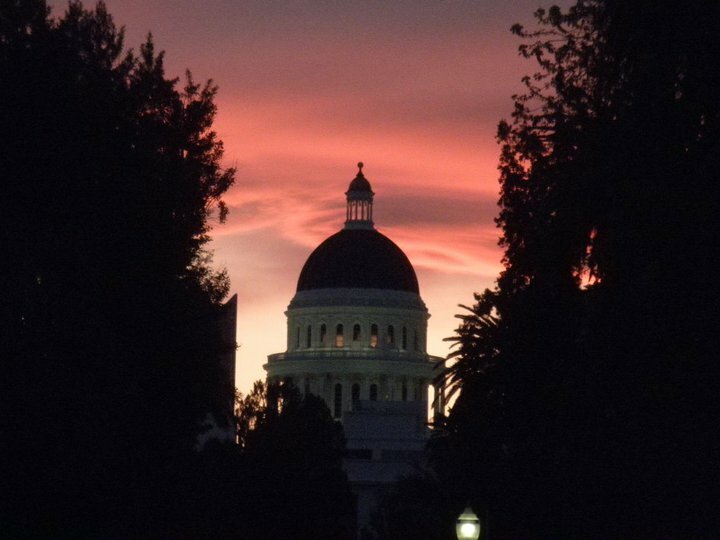 Mid Year Meetings and Realtor Rally.Rim of the World Association of Realtors will be well represented! If you’ve opened any messages from N.A.R., you know about the Realtor Rally at the Washington Monument on Thursday, May 17 – where over 15,000 Realtors from every state will be standing up for Home Ownership in America – the American Dream! We’ve been told by our Congressman and others that buyers need to have “more skin in the game”- meaning 20% or more down payment on a home mortgage. Realtors know what “skin in the game” really means to a home owner – it’s the school their kids attend, being a part of a neighborhood, a community, improving their home, building equity and all things connected with home ownership. We know that the Mortgage Interest Deduction is being scrutinized by Congress for reduction or elimination. Next week, every Congressman and Senator in our Nations capitol will be visited by Realtor constituents to let them know that Realtors support the preservation of Home Ownership in America and will vehemently oppose any legislation/regulation that threatens it. On May 17th – go on line and join your fellow Realtors in standing up for Home Ownership in America!! From: Carol Banner and Cyndy Davidson, Co-Chairs: Christmas in April Committee to benefit Rebuilding Together. Once again, our Community braved Friday’s snow storm to gather at the Lake Arrowhead Country Club for the annual Christmas in April Auction Dinner benefitting Rebuilding Together. The Rim of the World Association of Realtors, partnering with the Lake Arrowhead Country Club, helps our Rebuilding Together program fund it’s home rehabilitation projects in our local Communities with the Christmas in April Auction/Dinner. This year, with the help of Auctioneer Extraordinaire, John Wood and the sponsorship of the Lake Arrowhead Country Club, local Realtors were able to raise $20,000 to fund next years Rebuilding Together projects. The many wonderful auction items were generously donated by merchants and local folks. John Wood, Cyndy Davidson and Allison Banner made sure the Auction action was lively and moved quickly. Many, many thanks to all who participated. Very special thanks to the Lake Arrowhead Country Club for their sponsorship and to the Rebuilding Together Committee for organizing the auctioned items and keeping the books. Special thanks to the Realtor Christmas In April Committee. We can’t forget TIPS Printing for all the flyers and the Mountain News for all the wonderful advertising! Next year will be even better!!! Last Call! 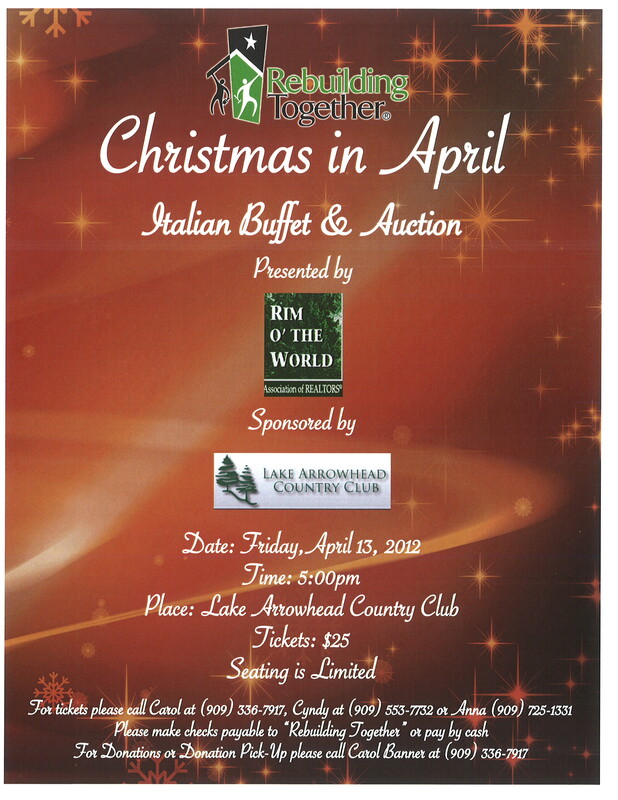 Christmas in April Dinner and Auction is Friday April 13, 2012 at the Lake Arrowhead Country Club. Don’t Forget to Get your Tickets! It’s almost that time again when our Community comes together to make homes safe and warm for those deserving folks unable to maintain their own homes. Rebuilding Together (formerly Christmas in April) has chosen 7 homes to rehabilitate this year. The Rim of the World Association of Realtors, along with the Lake Arrowhead Country Club, is sponsoring another One Big Realtor Event – the Christmas in April Auction-Dinner to benefit Rebuilding Together. Last year we raised over $18,000 – all because our wonderful community knows the value of coming together to take care of our own! The Lake Arrowhead Country Club is providing a bountiful Italian buffet. Auctioneer extraodinare, John Wood will again be with us. Every penny raised goes to Rebuilding Together to help with the rebuilding effort. Please plan to join us on April 13, 5:00 p.m. Dinner tickets are $25 and are available at Coldwell Banker Sky Ridge Realty in Blue Jay, Lakeview Realty in Lake Gregory or call Carol Banner, 909-553-6812 for ticket information or to arrange pickup for your auction contributions. We are experiencing an extremely dry winter and we are still in Fire Season as declared by the U.S. Forestry and local fire officials. Please be mindful of fireplaces, ash removal, and “defensible space” surrounding your property. We have seen a clear Real Estate market improvement in local buyer controlled sales. At the same time our listing inventory is shrinking – especially at the lower end. For all you sellers who have been waiting for the market to “turn around”, this could be a very good time to put your home/cabin on the market. Well priced homes are selling, sometimes with multiple offers – driving prices above asking. When this happens, appraisals move up also – another good sign for sellers. If you would like current market analysis on your Mountain property, please call or e-mail me. The Lake Arrowhead Communities Chamber of Commerce is holding their annual meeting on January 31, 5:00 to 7:00 PM at the UCLA Conference Center. I would urge all of you living in our community to attend – whether you belong to the Chamber or not. A great opportunity to learn more about this unique and beautiful community many of us call home. Speaking of things Chamber, The Outstanding Citizen dinner and dance honoring Mr. and Mrs. Neal Perkins will be held on February 4, 5:00 PM. at the Lake Arrowhead Resort and Spa: 5:00 for cocktails, 6:00 PM for dinner. Dancing follows the Outstanding Citizen presentation. See the Chamber website for information on this and other community happenings: events@lakearrowhead.net. We are looking forward to a more real estate friendly 2012!! 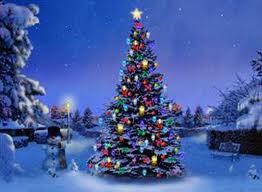 Here it is, almost Christmas. Again, we ask ourselves “Where did the year go?” As I sit here thinking about just that – I’m thinking of all the many blessings that offset the disappointments of this past year. While our Real Estate market is very slow to recover, we do still have buyers interested in our beautiful Mountains and while, few are looking here as full time buyers, vacation and investor buyers have managed to sustain us. I’m very grateful for the customers and clients who have worked with me. I value the new and long-time friendships that I’ve been fortunate to enjoy over my 25 year Real Estate career. Thank you to all those buyers and sellers with whom I’ve worked over the past year. As you know, I have a wealth of information and knowledge to share of this wonderful Mountain top based upon my 50 years of living and working here. Please call me, email me or stop by our Blue Jay Coldwell Banker Office. Merry Christmas and a joyous New Year! 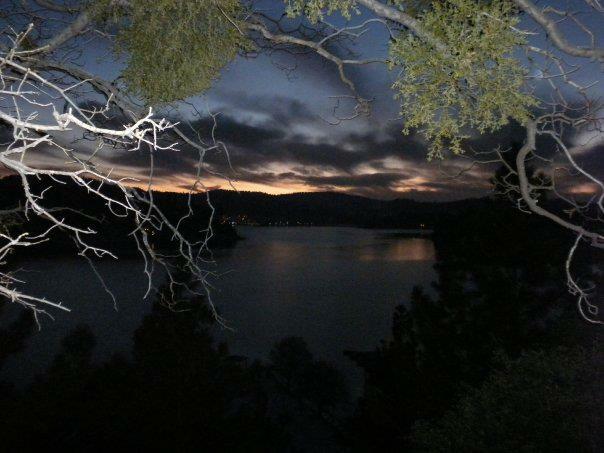 An owner of a home in Lake Arrowhead called me up to ask “Why are all buyers trying to beat us up?. The converation was about if all buyers are lead to believe that all homes listed are in a distressed situation, that they are in foreclosure, bank owned or short sales. The media is teaching buyers to make what is considered “Lowball” offers. Everyone wants to get the best deal, but how you go about it is just as important. 2. Find out if there are any other offers submitted, if so you may not have time to try a lowball or you could lose out to the other buyer(s). 3. Assess what the house is worth in today’s market so you can base your offer on real numbers. 4. Include a prequailification letter letting the seller know you are quailifed for a loan. 5. Often it is important for the seller to know why you offer what you did, some buyers like to add a letter why they offered what they did, listing an needed repairs with extimates to fix. Some offers come with a list of comps from the area on how they arrived at thier offer price. Seller’s have to realize that buyers are not waging war against them, but looking for the elusive best deal. I tell all the home owners when i list a home, that an offer no matter how low is a start to negotiatons. I tell them that they should not be offended, that selling your home is a business decision and needs to be treated as such. You can not have a sale without negotiations, you can not have negotaions without an offer, so when an offer comes in, it is a good thing not to be looked down on if it is low. Counter offer every offer that comes. No offer should ever be rejected outright. Just a not to add to the “Low ball offer” conversation: If the subject property is offered as a conventional sale, you may be fairly sure that their Realtor has advised the seller of what it takes to get a property sold in this market. Homes are only worth what buyer’s are willing to pay. 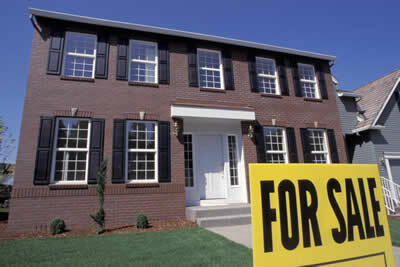 If a seller has a lot of equity, they may be facing a “short sale”. We Realtor have very specialized tools to help us ascertain the value of properties, the research has been done and those homes are usually priced accordingly. Buyers, if you’re planning on making a “low-Ball” offer, be prepared for a counter. Regardless of the type of a sale always be prepared with a prequalification letter, proof of funds, and representation by a Local Realtor who knows the prices and conditions in the area in which you’re interested.